I'm always neglecting my non-fiction shelves (non-fiction is hard! ), so I thought a good challenge would help with that problem! And, well, it has nerdy in the name. I couldn't resist. Check out the challenge page for the full details. I'll be going for the second level, Dork, which means reading 7 to 10 non-fiction books in 4 to 5 of the specified categories. As I read books for this challenge I will list them below. I would never do well with this challenge. 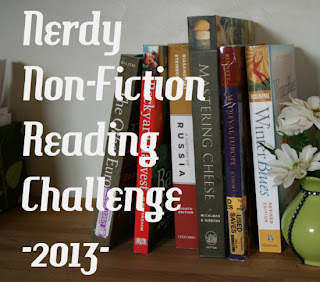 I only read 5 or 6 nonfiction a year. Maybe that will change now that school is done. Maybe I would want to more. I don't read a lot of nonfiction either, but I have built up a bit of a pile in a few different subject areas, particularly feminism and environmentalism, so I'm using this challenge to motivate myself to make time for those.